D. Ralph Millard, Jr., MD, FACS, Hon. FRCS(Edin), Hon. FRCS, OD Ja. 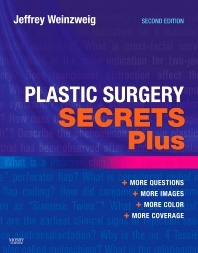 Plastic Surgery Secrets—the first Secrets Series® title in the PLUS format—offers an easy-to-read, information-at-your-fingertips approach to plastic and reconstructive surgery and hand surgery. Jeffrey Weinzweig has joined forces with world-renowned plastic surgeons Joseph McCarthy, Julia Terzis, Joseph Upton, Fernando Ortiz-Monasterio, and Luis Vasconez, and others to bring you the expert perspective you need to grasp the nuances of this specialty. This new edition features an additional color that highlights tables, legends, key terms, section and chapter titles, and web references. All this, along with the popular question-and answer approach and list of the "Top 100 Plastic Surgery Secrets," make it a perfect concise board review tool and a handy clinical reference. Maintains the popular and trusted Secrets Series® format, using questions and short answers for effective and enjoyable learning. Provides the most current overview and authoritative coverage of all topics thanks to contributions from an impressive list of over 300 experts in the field of plastic surgery and multiple related specialties.